Atlantis Redeemed is Alyssa Day's fifth book in her Warriors of Atlantis paranormal romance series, and it debuted at #22 on the NYT bestseller list last weekend. Alyssa's books are a wonderful mix of high adventure and paranormal romance, alpha males and strong female heroines. And of course there is Atlantis!. I had a chat with Alyssa about her writing and the series and she will be dropping by today to answer your questions. 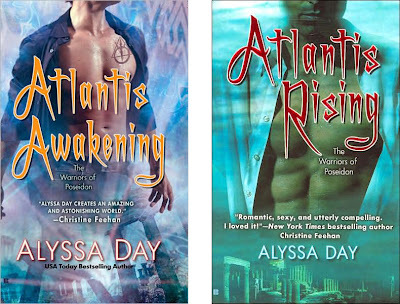 Alyssa has also kindly offered to give away three (3) copies of Atlantis Redeemed to some lucky commenters. Please visit Alyssa online at her website for excerpts, a free short story, video interviews, and more. Thank you!! SFG: Atlantis Redeemed is the fifth book in your Warriors of Poseidon series and was just released. Please give us an overview of the series so far and tell us what we can expect in Redeemed? The Warriors of Poseidon series is about a group of Poseidon’s warriors from the lost continent of Atlantis—and it’s not lost any more. They have been secretly protecting humanity for more than 11,000 years, but now that vampires, shape-shifters, and other paranormal creatures are out in the open and part of society, Atlanteans are planning to take a more active role. Through the course of the series, they must retrieve the lost gems of Poseidon’s trident, or Atlantis is doomed to remain at the bottom of the ocean forever. Luckily for the warriors, each meets a human woman with very special gifts—and falls in love on the way. Brennan stars in Atlantis Redeemed. More than 2,000 years ago, Poseidon cursed Brennan to live with no emotion. But the curse was far twistier than merely that—and the twists all come into play when he meets Tiernan, a human who is as beautiful as she is determined to discover the truth about a group of mad scientists who are conducting torturous experiments on shape-shifters. Did I mention she can tell when people lie to her? It makes for a very interesting relationship . 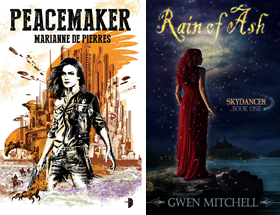 . .
SFG: Can the books be read standalone or should they be read in order? They can absolutely be read standalone. Each book is whole in itself. Of course, if you like Atlantis Redeemed, it would be great fun to go back and read all of the books from the beginning! SFG: What do you say to men to encourage them to read your books? LOL. I don’t know that I’ve ever tried to encourage anybody to read my books, man or woman. Seems presumptuous! But I do have lots of male readers (including you! Thanks! That review comparing parts of Atlantis Unleashed to a great Tarzan movie made my day.) One friend reported that a male bookseller literally took another romance novel out of her hands in the store and gave her Atlantis Redeemed. “This is better,” he said. “It’s not just about the love stuff.” Which cracks me up. I do love a good swordfight! But there is definitely a very emotional love story in Atlantis Redeemed. SFG: You’ve hit the NYT bestseller list with both Atlantis Unleashed and Atlantis Unmasked. How did that feel? Do you approach new projects differently as a result? And Atlantis Redeemed! It’s very exciting. It’s a very prestigious list to hit in the publishing industry, so there were tons of congratulations and well-wishes. My agent sent me a case of champagne! Actually, it made me feel a little more pressure to be sure the books are the best that can be, but since I’ve always worked hard toward that goal, it didn’t change that much. SFG: Alyssa Day is your pen name for your paranormal romance books but you have written a number of books under your real name of Alesia Holliday. Tell us something about the “other” you and do you have one book in particular that is special to you? 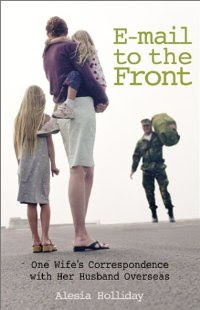 My Alesia Holliday books are comedies, and my most special book is my non-fiction, E-MAIL TO THE FRONT, my true story of what it’s like to be a military family when one spouse goes to war. I’ve received thousands of letters from military families thanking me for that book—for letting them know they’re not alone in having a hard time. SFG: I understand you are making a big move – to Japan! How will that affect your writing? Do you think you might use it to your advantage in a future story? I’ll definitely set a book in Japan! But NOT at the Pokemon theme park, as my children are suggesting. SFG: You’ve said you like to research lost civilizations. What is the most interesting thing you have discovered about Atlantis in your investigations? The many, many different places explorers have guessed, over the centuries, that it’s actually located. I have my own theories . . .
SFG:. What future projects are you working on or considering? I have an urban fantasy series debuting in 2011. I can’t talk about it yet, but I’m so excited about it! I was thinking about this yesterday when someone on a writing loop said “paranormal are so over.” I was reading a book of Scottish fairy tales at the time, and realized that the idea of something “more” than we can see and know in broad daylight has always fascinated us—and I think always will. Harper Lee. I’d love to ask her WHY she only wrote one book. Was TO KILL A MOCKINGBIRD so incredible that she had a massive case of second book syndrome and couldn’t find a way to another? With such a blazing talent, I wish the world had seen more of her work. Should I admit I’ve seen the new Star Trek movie 6 times? Or that I think I’ve read ever Asimov novel ever written? Or that I spent part of my childhood wondering if a planet with giant sand worms really existed? SFG: Tell us three things about yourself that nobody else knows (until now of course). Ha! Nice try. How about three things not many people know? I have a passionate, virulent hatred of mayonnaise. For years, I had my kids convinced I was a werewolf. When 2,000 years of lost emotion hit you all at once—do you fall in love or die? Three copies of Atlantis Redeemed to giveaway courtesy of Alyssa Day, names to be drawn randomly. Leave a comment or question for Alyssa. For fun tell us - Do you believe Atlantis was real? Is Atlantis real? Its interesting to think about but have no clue. I for one, love mayonnaise, lol!!! Good luck on the move ALyssa! Love your books, cant wait for Atlantis Betrayed!! Congrats on all your success!! 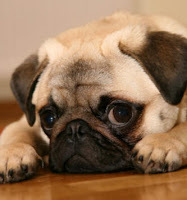 Oh how I love pugs too! More so, I love this series. Great interview with Alyssa, I found your questions refreshing and most important, interesting! Please enter me, it's on my to-read list. I just picked up Alyssa Day's series and LOVE it so far. I also follow Alyssa Day on Twitter and Facebook and enjoy seeing what's going on...and is how I found out about this giveaway and interview! I do have a question: Alyssa, I love the rich world you've created in all the books of Warriors in Poseidon. How did you come up with the idea? I haven't read any books from this series but would love too. I do believe that Atlantis may have been real. I don't know if we will ever know. I've been wanting to read this series for a while. My question to Alyssa is if you could keep any of your males for yourself, who would you pick? Hi Betty! I've been fascinated with Atlantis since I was a kid, and the rest? Is all due to my very dark and twisted mind. I like to find the weird/strange/crazy situation and toss my characters directly into the middle of it! Hi Stephanie! Ooh, the hot guy question!! I have my own hot guy Navy fly boy at home, so I can't keep any of them. Boo. I hate to admit it, but I do fall a little in love with each hero as I'm writing them. Yummy, tortured Atlanteans. I would love to win, I am totally in love with all the books so far. Is Atlantis real? Oh yeah I believe it is out there somewhere just waiting to be discovered and it would be nice if it was just as the books and full of yummy, edible men!! For those of you that haven't picked up one of these books, do it now! Seriously can't recommend them enough. It's a great series full of fun, a bit of mystery, a healthy dose of romance and a lot of action. My question to you Ms Day would be, when and if the warriors succeed in finding all the "treasures" not to give too much away, will that be the end of the series or do you have further directions in mind? Spin offs? love this series. And I'd love to believe Atlantis was real and maybe still is hidden under the sea lol. Of course Atlantis was real! C'mon now, we all know that! Lol, but seriously. Wouldn't it have been amazing? Great interview! Thanks for sharing and introducing be to another series/author i have not yet experienced! Loved the interview and I think it's possible that Atlantis is real. Also, where did you get that pug picture?? WANT PUPPY!!!! Maggie Mae, thank you so much!! We're still deciding on the ultimate future of the series, but I can promise you now every warrior, plus Alaric, plus Jack and Daniel, will have books if I have any say in it!! Thank you so much, everyone!! I've had so much fun here today. I Love your covers! They are hot! And I do believe, I mean, why not? There are probably plenty f things in this world we dont know about. Have you ever thought to collaborate a book with other author ? if yes, who will you choose? Your covers are always so awesome, I totally love 'em! I'd like to think Atlantis is real! Love this interview, made me smile, so thanks!!! I love the covers too. I don't care for mayo either!! I love your books they are great..Do I think Atlantis really existed? Sure, why not?? Kids are very perceptive you know. How do we really know you AREN'T a werewolf ? We had one female pug who was so fat and calm we called her YODA (always reminded us of the Star Wars character). Alyssa, thanks a lot for the interview - I really enjoyed reading it! I would love Atlantis to be real because its amazing if there was a place that magical. I love your books...the romance mixed in with political intrigues and power struggles, peppered with Atlantis, shifters, humans, and vampires is awesome! I do believe that Atlantis is real, and no one can tell me otherwise. Is Atlantis real? I think it might have been. Maybe not like all the myths, but it could have been a real place that disappeared into the sea. You convinced your children you were a werewolf? That is so awesome! What finally clued them into to the fact that you aren't actually a werewolf? Or are you? I'm undecided about whether Atlantis was real or not. I'm not ruling it out. I always think to any myth or story a beginning was there....true or not I kind of like believing in Atlantis esp with those Warriors! I always think to any story or myth a beginning had to be there so I kind of like to believe esp with those Warriors! Thanks for them Alyssa! I always think to every myth or story there had to be a beginning so I kind of like believing in Atlantis even if it is in my fantasy world esp with those warriors!!!! There are so many things deep in the ocean, why wouldn't Atlantis be real? I won't stop believing until the ocean is mapped, its such a great idea. Pugs! I have two, and really would like to foster pugs from the local rescue society, but I don't think I could ever give one up! For the mean time, I have a fawn and a black pug, Hobbes and Roxy respectively. Although I haven't read any of your books to date, I've added them to my list to pick up! Thanks everyone!! I had the best time here!! I think that there is a possibility that Atlantis is real. Like to keep an open mind. OMG! I thought I was the only one that HATED mayo. I can't even stand to touch it. If its gets on my fingers when I pack my husbands lunch I freak. I don't know if Atlantis is real. But it is fun to read about. I'm afraid I'm not with you on the mayo or the pugs. But the Atlantis series sounds great. So many writers have different takes on Atlantis and it's so interesting to read them all. I like Pratchett's "Nation" take on it but Orson Scott Card's is also interesting because they both look at it a bit differently. Looking forward to reading your take on it. I also love the tag of Atlantis Redeemed: "When 2,000 years of lost emotion hit you all at once—do you fall in love or die?" gives me the shivers, so powerful and tense! Yes, I believe there is truth in the Atlantis myth. I hope you enjoy your time in Japan. I was recently there (not Tokyo) and everyone was very nice to us. Be sure to visit the 100 yen store, where everything is 110 yen, not 100. I think it's entirely possible there was a city built near the ocean or on an island which was covered by water. However, it wasn't futuristic or anything like that. As for Atlantis been real, I think maybe but not exactly the way it is always portrayed. I really like Ms. Day's series. Lots of fun to read. Atlantis has always been a huge fascination point for me. I can't remember the exact first time I found out about Atlantis but I know I was very young. Ever since then I've been on the hunt for books/TV Shows/movies based on Atlantis also any fact (or fiction) in the news on Atlantis. I'm not sure if I believe entirely that it existed but I know a bigger part of me sure hopes that it did. Terrific interview! I haven't read any books from this series but would love to. AS for Atlantis, I do believe it existed or there wouldn't be so much talk about it. No one believed Troy existed before it was found either so maybe one day they will find Atlantis. Haven't heard of this series before, but it sounds interesting.